Want to keep your house clean but short on time? 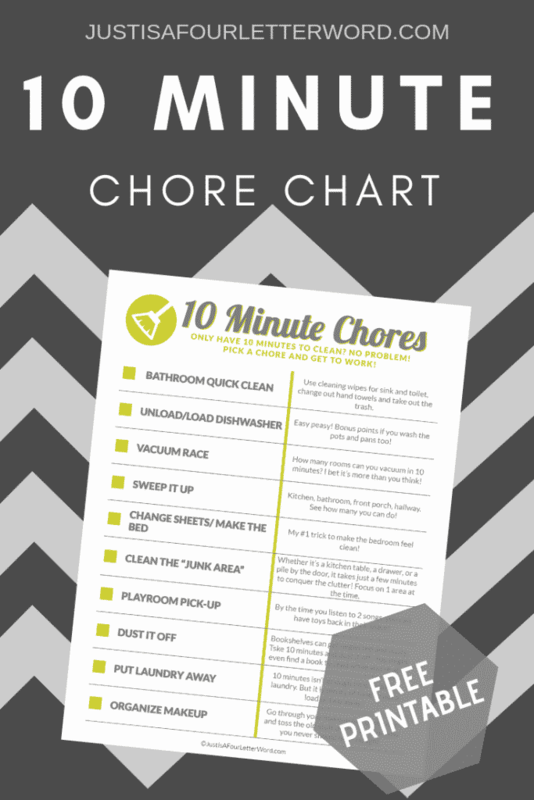 Grab this free 10 minute chore chart to get started. You might be surprised at how much you can get done! I am no expert on cleaning. Let’s just get that out of the way. However, I have learned a few things over the years. Gone are the days of spending a Saturday morning cleaning the whole house and not looking at it for another week. Or at least I hope they are gone. We still do that from time to time. The thing is, working from home and raising two boys in the same home means we don’t leave in the morning and come home to an unchanged house 10 hours later. We LIVE here. And living is messssssy. My posts contain affiliate links which means I may earn money from purchases made using my links. I am learning to clean as I go and do little tasks but it’s a constant struggle. Constant. I have had to reprogram my brain that tells me I can’t do anything unless I have an hour or two to dedicate to the task. The problem is when I have a few minutes here or there to take care of some clutter or a mess, I get bogged down in deciding just WHAT to tackle. There is so much to clean and so little time. I probably waste 10 minutes just deciding! I would rather spend that time on my 2019 reading list so I needed a solution. I made a this 10-minute chore chore to cut down on my indecision. Because some days you need to learn how to remove candle wax from carpet (ahem) but most of the time we just have to clean up after ourselves. This way I can just pick something off the list and get to work. I also made a free printable for you in case you are like me and need a little nudge here and there. Feel free to print it out and start cleaning! Oh and if you really want to geek out with me (you know you do) go ahead and laminate it so you can use it over and over! I have this laminator and laminating sheets from Amazon and they work great! 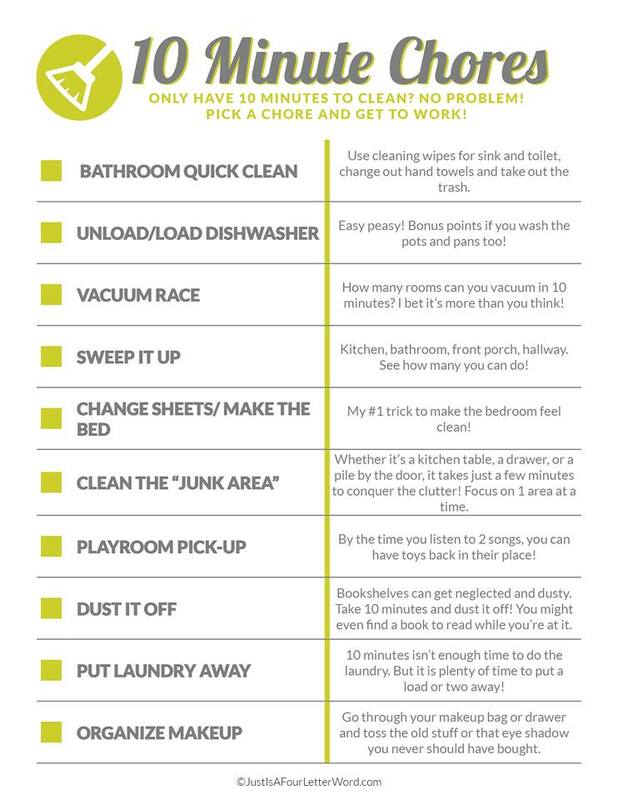 Click on the chore chart below to open the pdf and print. And no, our house is not clean most of the time. This is me trying to get control of my life! So no shame and no pressure. Does this mean my house will be spotless? HAHAHAH. No. It just means I won’t have to wait for hours on end to play catch up. Tips n tricks, friends. Tips n tricks. Not sure if you’re doing what you should around the house? The book Home-Ec 101: Skills for Everyday Living – Cook it, Clean it, Fix it, Wash it has great practical advice that will help you get control of your house. Genius. Like seriously. Is it really dorky that I’m super giddy about this printable and concept? Yay! So glad you like it. Enjoy!